Wow! 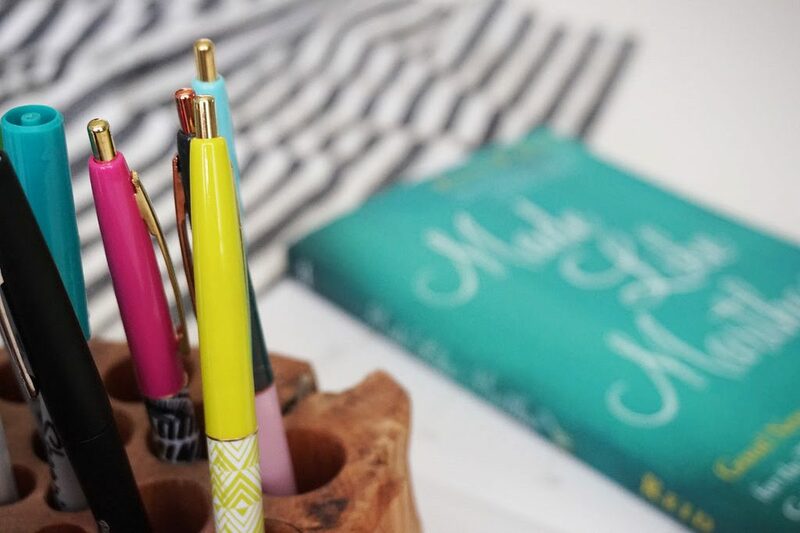 Thank you to everyone who has already purchased a copy of my book, Made Like Martha: Good News for the Woman Who Gets Things Done! On launch day (July 10th) it hit #1 New Release in four of its categories: Christian Bible Study Guides, Women’s Christian Living, Christian Education, and Christian Women’s Issues! We stand amazed at what God has done, is doing, and will do with this message of grace and freedom. While the book includes many insights from the author herself, she is mindful of the many different types of Martha’s she may have in her audience. She shares stories from friends, family, colleagues, and mentors to add depth and diversity to the narrative. At the end of every chapter, Reid graciously shared a space for these women to give their first-hand accounts of being a get-it-done type of gal. Now that dear Martha is out in the world, we thought it’d be fun to go through the book together. We’ll be reading one chapter a week from Tuesday, July 24th – Tuesday September 25th, and I’ve invited some fabulous friends to host each week of the book club. We’ll supply everything but the treats and drinks. Each Tuesday, I’ll be introducing the host and sharing some of her reflections on that week’s theme, right here on my blog. I’ll then link over to her site for you to read her full post. She’ll pose a question for us to discuss in the comments on her blog. 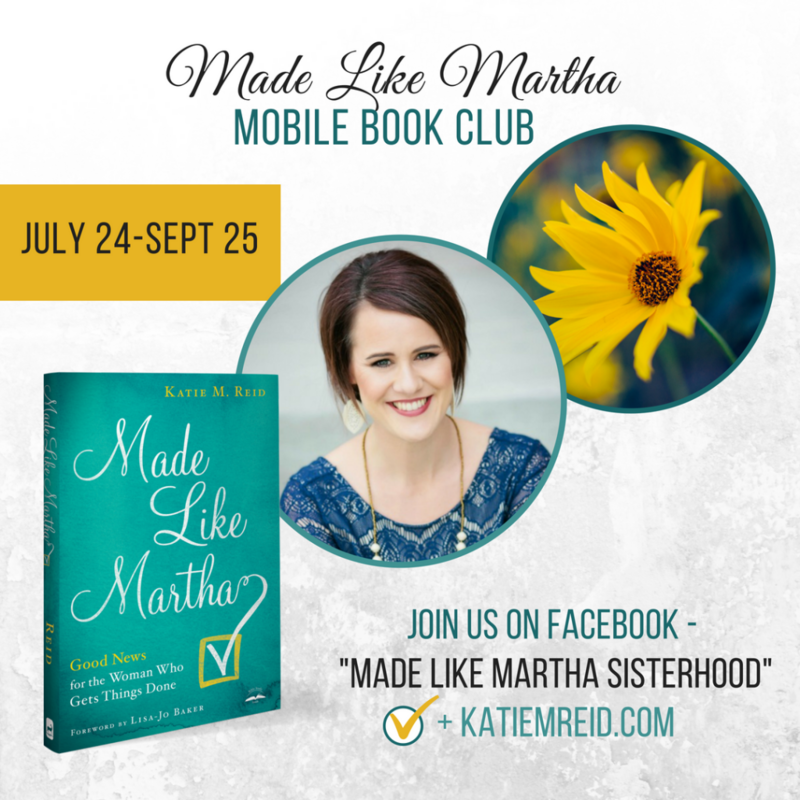 Then almost every week, the host and I will do a Facebook Live together (on Wednesdays) in the Made Like Martha Sisterhood (Facebook Group). * We’ll interact with you during the live chat, and you can ask questions and share your insights over there too. There may even be a few surprises! I can’t wait to go through Made Like Martha with you and these gracious hosts. Invite your friends and join us! 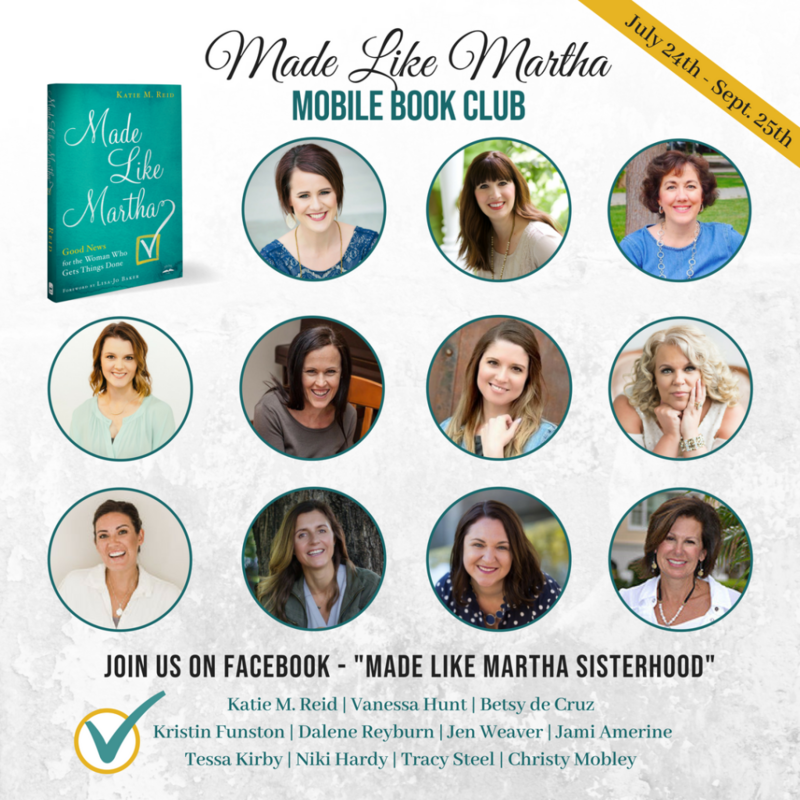 The mobile book club will be housed on my site and in the Made Like Martha Sisterhood (Facebook Group). It’s free to join! The Sisterhood is a gathering place for those who want embrace their God-given design for His glory and the good of others. Head over and introduce yourself. We’ll kick things off officially on July 24th (the day the book club starts). 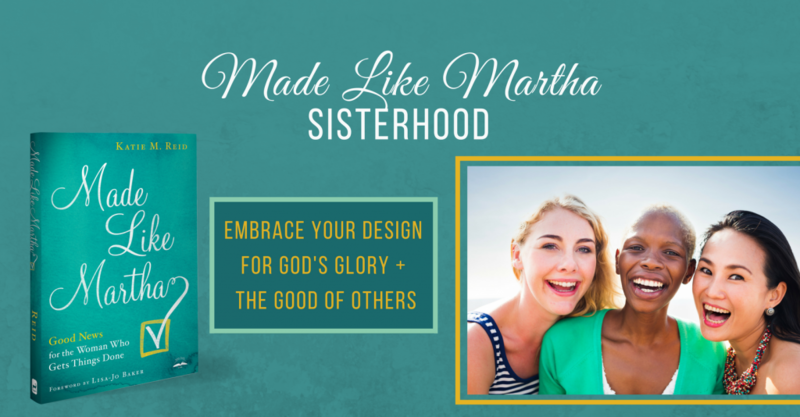 **If you haven’t gotten a copy of Made Like Martha yet, today is the day! It’s Amazon Prime Day (July 16th at 3pm ET-July 17th at 11:59PT) and there’s a fantastic book deal (affiliate links below, if you choose to make purchase through the link(s), I will be compensated at no additional cost to you. Read full disclosure policy here). This year Amazon is offering customers $5 off orders of $20 or greater! In order to take advantage, prime customers can use promo code PRIMEBOOKS18 at checkout once the total value of the books in your cart is at least $20. The book is discounted already, so grab two copies (one for you and a friend) and get $5.00 off and free shipping with Prime too! Then you’ll be all set for the Mobile Book Club- win, win! I had so much fun reading the audiobook for Made Like Martha! My midwestern accent is strong as ever- enjoy! I may have thrown a few other accents in too. Ha! An honest, beautifully-written book that maps out a story of longing for home in the tailwinds of uncertainty and loss. More than the account of one woman’s journey, this is for all of us who ache for solid ground in between what if and now what. From the tulip-lined streets of Holland, Michigan, to the vibrant coastline of Cape Town, South Africa, you will land closer to the hope of your eternal home as you unpack Motaung‘s moving memoir. In uncertain times, it is imperative to be grounded in timeless truths, convinced of the unchanging nature of the one true God. This I Know is an anchor of hope to calm your fears and bolster your faith. Move from head knowledge to heart knowledge as you interact with this captivating and approachable study. Thank you Amber and Wendy for thoughtfully and honestly addressing numerous issues that set us off, and then pointing us to a better way through God’s Word. Bringing these triggers to light empowers us to move forward as kinder, wiser, and better-equipped moms. Behind the successful launch of this book, is a small (or not so small) army of people who helped champion its message. You can read the acknowledgements for those that are on that list. But I wanted to take a moment to thank our outstanding book launch manager, Kaitlyn Bouchillon, and all the members of Team Martha (a.k.a. the book launch team) who have gone above and beyond, sharing this message of grace and freedom. Linkup your encouragement below!